Short and sweet – you don’t want your custom Twenty Sixteen theme using bloated old Google Fonts? Simply add this function to the functions.php of your child theme. Don’t wrap it in an if ( ! 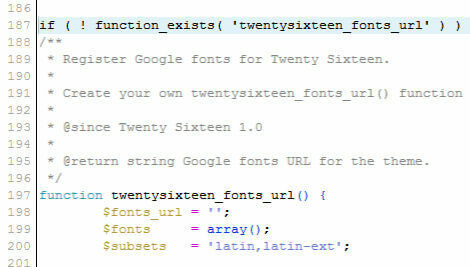 function_exists( ‘twentysixteen_fonts_url’ ) ) because you’re overriding the function from the main theme. It does exist, and you want to override it. You can just hack the main themes function file if you like, but you’ll lose the changes if you apply any theme updates. Which is why you use a child theme, right? Won’t this make Twenty Sixteen look all ugly? No, the font stack will simply fall back to using Goergia and Helvetica Neue. Or you can just customise these to your own preference of course. How Do I Remove Fonts Without Writing Code? There are a couple of plugins that will do this for you, just check the Plugins Directory here. These will of course work for other themes too. Your Apache htaccess ‘Order Deny, Allow’ Not Working?